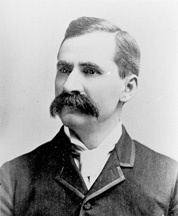 HANSBROUGH, Henry Clay, a Representative and a Senator from North Dakota; born near Prairie du Rocher, Randolph County, Ill., January 30, 1848; attended the common schools; moved to San Jose, Calif., in 1867; learned the art of printing and worked at the trade in San Jose, Calif., and later at Baraboo, Wis.; moved to Dakota Territory and established the Grand Forks News in 1881 and the Inter-Ocean at Devils Lake in 1883; mayor of Devils Lake 1885-1888; member of the Republican National Committee 1888-1896; upon the admission of North Dakota as a State into the Union was elected as a Republican to the Fifty-first Congress and served from November 2, 1889, until March 3, 1891; did not seek renomination in 1891, having become a candidate for Senator; elected as a Republican to the United States Senate in 1891; reelected in 1897 and again in 1903 and served from March 4, 1891, to March 3, 1909; unsuccessful candidate for reelection in 1909; chairman, Committee on the Library (Fifty-fourth Congress), Committee on Public Lands (Fifty-fifth through Sixtieth Congresses), Committee on Agriculture and Forestry (Sixtieth Congress); resumed his former business pursuits in Devils Lake, N.Dak. ; moved to Florida, New York, and finally to Washington, D.C., in 1927, where he died on November 16, 1933; cremated and the ashes scattered under an elm tree on the United States Capitol Grounds, Washington, D.C.
Schlup, Leonard. Henry C. Hansbrough and the Fight Against the Tariff in 1894. North Dakota History 45 (Fall 1978): 32-39; Schlup, Leonard. Quiet Imperialist: Henry C. Hansbrough and the Question of Expansion. North Dakota History 45 (Spring 1978): 26-31.